Valentine’s Day is just around the corner, less than a month away (eek!). 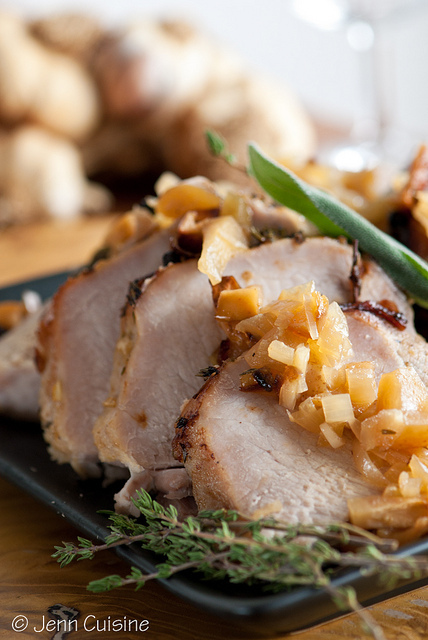 If you want to be sure to impress your loved one this year by preparing a dinner that is sure to get raves, consider brining a poultry or pork roast. Brining is the technique of soaking meat in a flavored salt solution prior to cooking. It takes very little added time on your part, and is totally customizable – whatever herbs and spices help to evoke the best memories & moments between you can be used. Even the simplest of brines can elevate a lean cut of meat from just “good” to having your special someone talking about it for years to come – after all, the way to one’s heart is through the stomach, right? Chemically speaking, how does brining work? So how does brining work its magic to create that moist and juicy, flavorful roast? In short, there are three elements to a brine that work in concert together. Firstly, water is transported from the meat to the brine via osmosis – i.e. water molecules diffuse across cell membranes out to the brine solution. It seems a bit counterintuitive – after all, wouldn’t losing water dry the meat out? But we have to remember the other key component to brine, salt. As water is drawn out of the meat, salt also diffuses in, as part of chemistry’s eternal goal to achieve equilibrium. The stronger the brine solution, the larger the salt concentration gradient will be inside vs. outside your meat, and thus the faster the process will occur. This means that if you’re in a rush, you can play with a brine recipe to make it stronger and cut down on the time required to soak. The resulting higher salt concentration in the meat actually alters proteins and their interactions within the muscle, dislodging the anchors that hold the fibers together. Subsequently, the filaments of the muscle fiber become less structured. They start to swell as water now enters more freely back into the tissue, allowing the meat to retain its moisture better when cooked. More moisture trapped while cooking makes for a juicier and more succulent roast. And last but certainly not least, the third element of the brine is the flavoring. All of this diffusion back and forth affects the flavor elements too, allowing you to flavor the meat throughout rather than just on the surface. 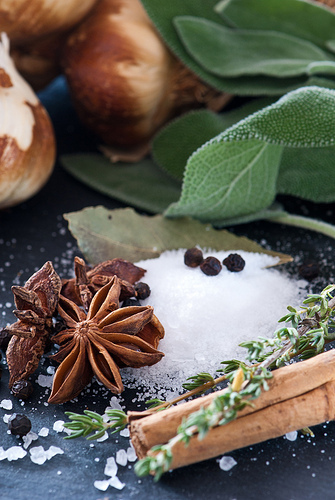 The spices and aromatics in a brine are the most flexible part of the recipe, and you can feel free to use whatever you like best that you think will make a winning combination to complement the rest of your meal. Often a little sweetness is added as well (sugar, maple syrup, molasses, it’s totally up to you), which adds a nice contrast to some of the increased salt. Use the type of salt and the amount directed in your recipe. This is a process dependent on mass rather than volume, and kosher/table/sea salt each weigh a different amount per cup. Read labels if buying frozen meats to make sure that it hasn’t been pre-injected with a salt solution, which may result in an overly salty roast. Brined meats tend to not need to cook as long as their unbrined counterparts, so you may want to check meat temperatures a littler sooner than you normally would.